View More In Carpet Flea Powders & Sprays. 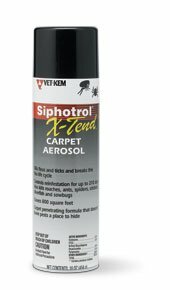 Siphotrol X-Tend Carpet Aerosol kills adult & pre-adult fleas. Contains Insect Growth Regulator. Reaches the hiding places of insects in rugs, carpets, drapes, pet bedding, upholstery and furniture. Protects the household for 210 days.